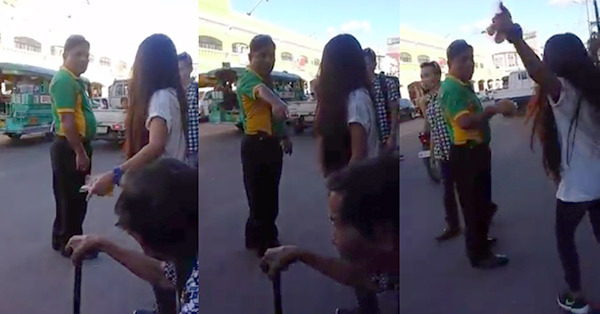 A video that captured an altercation between a girl who tried to help an old woman and a traffic enforcer in Cebu has gone viral and sparked an online debate. Grace Morgan, friend of the girl named Lenny, uploaded the video on January 15, 2016 during the Sinulog and celebration of the Feast of Santo Niño, the city's patron saint. Based on her narration, Lenny said she tried to help a senior citizen from Mabolo and asked her friends (Morgan and her siblings) to look for a taxi but failed as it was very difficult to find one at the time. Lenny decided to approach the traffic enforcer and called him multiple times but he did not listen so she asked, "Kuya are you deaf?" The traffic enforcer suddenly turned to her and allegedly yelled and said he is not deaf, then threatened to slap her in the face. Embarrassed, Lenny walked away but the traffic enforcer apparently chased her and pointed fingers at her. In the video, the traffic enforcer refuses to lend the old woman some help as they were helping another person. Lenny revealed that the uniformed personnel and his companions were assisting a foreigner (an American) who was on a wheelchair. Pasikaton Ta si Manoy nga Cebu City Traffic Enforcer! The 27-second clip already garnered nearly 300,000 views on Morgan's page and over 70,000 views on the Facebook page of Real CEBU Media. Netizens shared their views on the matter. Some argued on who's at fault, whether it was the girl, the traffic enforcer, or family members of the old woman. Amid the online debate, Cebu City Transportation Office (CCTO) executive director Rey Gealon posted a comment to apologize for the incident involving one of his men. 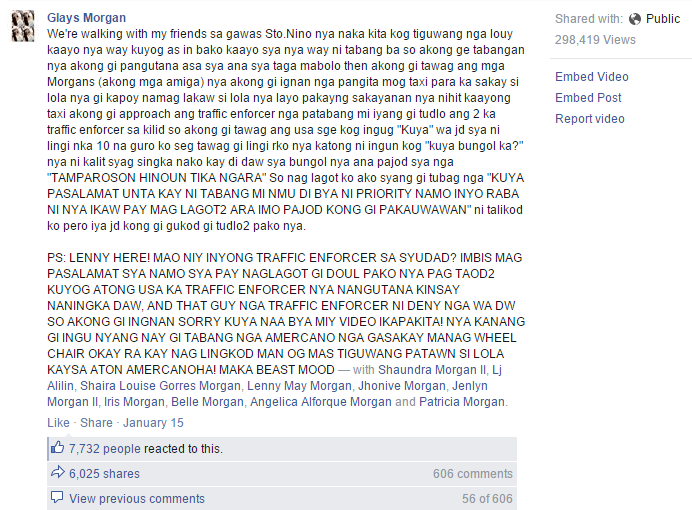 "I was tagged by facebook friends of a posted video involving a ccto traffic enforcer & a young woman in an altercation. I just saw it in my phone this morning on my way to d fluvial parade. I was surprised to witness one of our own showing what appeared to be a disrespectful, discourteous & disdainful conduct unbecoming of a traffic officer & supposed gentleman. At the outset, my apologies on his behalf in my capacity as ccto's executive director. I appeal & beg for patience & understanding from all cebuanos & everyone here present considering that all your cebu city traffic enforcers has been deployed 24/7 with an additional hour per shift under a "no leave, no absence" policy since the hosting of APEC. That, notwithstanding, this incident has to be investigated & due process has to be observed for him to be able to explain his conduct & hear his side of the story. On monday, I will convene the investigating body to send him NOTICE TO EXPLAIN directing him to explain in writing within 24 hours & adduce exculpatory evidence & thereafter, render a decision based thereon. Expect a development of this case before this coming week, ends."